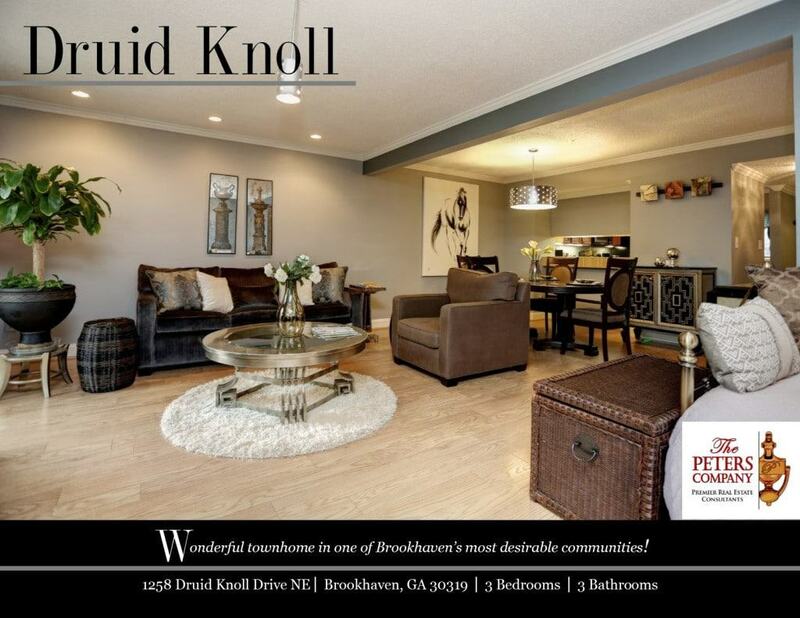 Just Listed :: Wonderful Townhome in Brookhaven's Druid Knoll! Welcome home to this wonderful townhome in the popular Druid Knoll community. The flowing floor plan, custom features, and charming character will never go out of style. The close proximity to Peachtree Road, I-85, and GA400 makes it convenient to and from any direction. Being in the booming City of Brookhaven means you can enjoy the shopping and restaurants in nearby hot spots like Town Brookhaven and Village Place Brookhaven! Kitchen features stainless steel appliances, granite countertops, plenty of cabinet space, and large pantry. The main living area is accented by gleaming hardwood floors, beautiful crown molding, and includes a nice combination of living room and dining area which are perfect for entertaining. The spacious living room also has recessed lighting and a cozy fireplace with sleek tile surround. Master suite is a true retreat complete with dual closets and private master bathroom. The patio is great for outdoor enjoyment and entertaining. A large shed provides plenty of extra storage. Wonderful community amenities include professional landscaping and a well-maintained pool.